There’s an infographic that is making the rounds right now that is a cheat sheet for public speaking. You’re not. And while all these tips are well-intentioned and some are even good advice, without context they are meaningless. Because for some speeches tips like these do not apply. Take for example, Darren LaCroix, in his speech “Ouch” he walks on stage, starts his speech, and falls flat on his face. Then proceeds to deliver the next 30-seconds of his speech lying on the ground. Doesn’t that break every presentation tip that you’ve ever read? It sure does, and that speech got Darren LaCroix crowned as the World Champion of Public Speaking in 2001 and launched a lucrative speaking career. What if we stopped treating public speaking like a checklist and started creating art with our presentations instead? This is an idea I’ve been toying with lately. I’ve stopped writing articles based on speech making tips because without context a certain tip is utterly useless. Here’s the disclaimer folks: If you are just starting out speaking, this article is NOT for you. Beginning speakers need to know the rules first. Once you know the rules, then and only then, can you rip up that rule book and set it on fire. Do you really need to “tell ‘em what you’re going tell ‘em, tell ‘em, then tell ‘em what you told ‘em?” Probably not, but if you’re doing a highly technical presentation this might be a good idea. Do you always need to be making eye contact with your audience? No. Darren didn’t when he was lying on the floor. I don’t when there’s a dramatic moment in my speech. Must you stand up and give your speech? Not necessarily. Richard Branson does his speeches seated. Experiment. Play. Set the goal of breaking 1 or 5 public speaking rules the next time you craft a speech. See what happens. Keep what works and ditch what doesn’t. Why break the rules? Why rebel against the presentation status quo? You’ll stand out, your presentation will be remarkable, and you’ll create an unforgettable experience for the audience. And most importantly, the audience will want to deepen and continue their relationship with you. If you follow the rules that everyone else is following, you sound like everyone else sounds. And you’ll languish in the sea of sameness. It’s time to embrace your inner communication rebel. 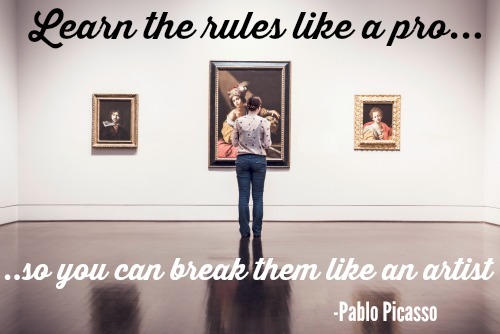 What rule are you going to break?